I’ve been working (or not working, as the case may be) on the Pacific Northwest Shawl for quite awhile. Ok… a long, long while. I decided that I was feeling a little lace Jones, and the PNW Shawl would be a good project to take to Victoria. I was planning, as you recall, that my little Victoria jaunt would include lots of sitting on the balcony basking in the sunshine while soaking up the view and knitting time. That’s not exactly what happened, but that was the plan. The STR County Clare went in my purse as a pick-up project between bouts of serious balcony-sitting. So, as I packed I grabbed the bag that holds the PNW Shawl, and reached for the pattern where I always keep it under the project bag. Racking my brain for clues to the whereabouts of my pattern, I seemed to remember that I put both it and a never-knit but interesting sock pattern in a safe place where they wouldn’t get lost before I turned my short attention span back to them. Yep. That’s where the pattern was all right! I confidently strode to my safe place. OK. I do have more than one safe place. I have two normal safe places. I confidently strode to the other safe place. I went back to the first safe place and looked again. The pattern had not magically appeared. I went back to the second safe place and looked again. The pattern had not magically appeared. I scratched my head a couple of times. Those were my only safe places. I went back to the first safe place and tore it to pieces looking. If the pattern had been there, it could not have escaped notice. It wasn’t there. Lather, rinse, repeat at safe place #2. You get the idea. I went back and forth several times, and I couldn’t find that @#%& pattern. In the end, I discarded the idea of getting to work on lovely lace, and packed Clapotis #2, which I never touched because most of my knitting time was outside the room with only the socks to keep me company. When I came home, not believing that the pattern would simply be gone, I looked in both safe places again. It wasn’t there. If you think I’m exaggerating this story, you don’t know me very well. I even toyed with the idea of asking #1 Son if he had borrowed my lace pattern (he already knows that his mom is a little strange, so no harm would be done). But in the end, I decided that I might never hear the end of that. Last night at Tangle knitting night, D mentioned that she was interested in trying some lace, which I heartily recommended. I told her about my fruitless search for my pattern, and said I might have to buy the thing again just so I could finish the project. We had a good laugh about it. Ha ha. At home, I thought to myself self, you have got to find that pattern. It has to be somewhere in the house. Knowing that it was fruitless, I went over to safe place #1 and stood there staring at it. Out of the corner of my eye I caught a glimpse of one of my stash bins. The stash bins are opaque plastic. I could see that there was something paperish looking in this one. I whipped the cover off. I put it in the normal safe place. Let’s see how long I can remember that, because… well I do have several competing projects and some of them actually have deadlines, like birthdays and Christmas. The picture is my progress on the Victoria socks. I’ve turned the heels and started up the ankles. I’ve done about 1/2 of one pattern repeat. I’m rather pleased with the heels. They are plain stockinette with a garter boarder. The toes don’t look nearly as funky as the one in the top sock appears to be. Really. 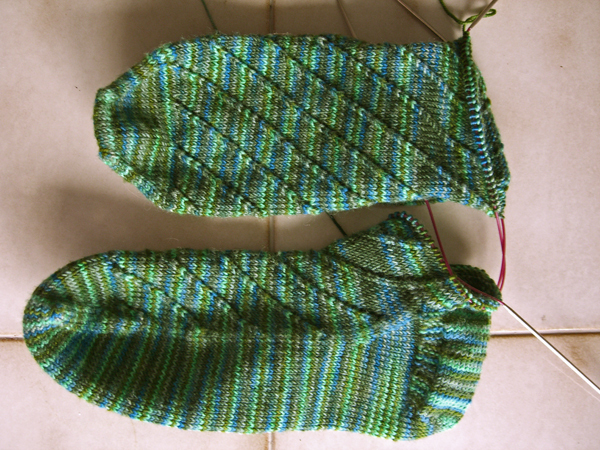 You can also see in this picture the tiny big of dark green and blue-ish pooling over the gussets. See it? It’s not that noticable in person either. I’m very happy with how this yarn is knitting up in this stitch pattern. One thing I hadn’t thought of though: as the K2tog/yo pattern spirals around the sock, there will come a point where the K2tog must be worked with one stitch on one needle, and the other stitch on the other needle. That’s pretty annoying when doing two socks at once because you can’t just move the stitch over – the other sock gets in the way. Fortunately it only happens once every dozen rows or so. Have any of you knit the Swallowtail Shawl in the new Interweave knits? The yarn it calls for comes in slightly larger skeins and I think is finer than the Seasilk. I’m wondering if I will have enough yarn to complete this project. I’m open to suggestions for patterns with this yarn. I don’t want something that will detract from the gorgeous colors. And many stitch patterns would get lost in it. What do you think? Let me know! Oh dear, I think I am in danger of becoming a sock addict. It just seems like magic. I twist a stitch here, knit a couple of stitches together there and now I have a little cup to hold my heel. I gently pick up the heel to send it home with the rest of the foot and next thing I know I have a warm place for my toes. Itâ€™s magic. I am enchanted. Okay, so itâ€™s just one little baby sock and the toe looks like someone cut it out with pinking shears, but it is MY sock and I love it! heh heh… I told you that you would be assimilated! 😉 I bet your sock is very cute! And you should love it. Thanks to every one else who commented, too!